All are considered to be toy dogs with a shoulder height of 7 to 8 inches and a weight of 6 to 12 pounds. The stop of the dog is very pronounced and the muzzle is short. The tail of the Griffon is usually docked and the ears can either be clipped or left natural. The coat of this dog comes in two varieties, smooth and rough. The rough coated Griffon has a wiry, longish coat with distinctive facial hair. The coat of the smooth is short and glossy. The Griffon will generally live to be 12 to 15 years old. This dog is also known as the Petit Brabancon and the Griffon Bruxellois. The first artistically rendered appearance of the Brussels Griffon is in the painting 'The Arnolfini Wedding' by Jan Van Eyck. This masterpiece was created in 1435 and shows the Griffon looking confidently out of the painting. The Griffon was used as a ratter in stables in its native Belgium and it is thought that the original dog was crossed with the Affenpinscher, the Pug, and the King Charles Spaniel to arrive at the dog with which we are familiar today. The Brussels Griffon makes an excellent companion dog and is cheerful and confident. It loves to cuddle up with its favorite person and will expect plenty of attention. This small dog sometimes needs to be reminded of its size when trying to dominate dogs much larger than it is. The Brussels Griffon tends to bond strongly with one person and should be considered a one person dog. As such, it is probably not a suitable dog for homes with children, especially small ones. However, the Brussels Griffon does get along well with other household pets. As with all short-faced breeds, the Brussels Griffon can suffer from breathing problems. It should also be kept as cool as possible when the weather is hot. This breed can also have problems with their eyes, such as cataracts. The Griffon often experiences trouble with whelping and caesarian sections are often called for. Although the smooth coated Brussels Griffon does not need more than a weekly brushing to keep the coat in good condition, the rough-coated dog will need rather intensive grooming. The dog should be brushed every day to keep mats and tangles from forming. Some people prefer to clip the rough coat shorter for ease of care. It is sometimes necessary to trim the hair on the hindquarters for sanitary reasons. As the Brussels Griffon is exclusively a companion dog, it belongs in the house or apartment with the human with whom it has bonded. It is quite active and playful indoors and will get much of its exercise in this fashion. The Brussels will appreciate a walk every day, however, and should be given the opportunity to stretch its legs. This dog is unable to live outside and as it can suffer from heat stroke easily, should be kept out of the sun during hot weather. For more information on different Dog Breeds, Dog Training and Teacup Puppies for sale including Yorkies, Chihuahuas, and Morkies please visit our websites below. There are three types of the Griffon, the Brussels Griffon, the Belgian Griffon and the Petit Griffon. The Brussels Griffon was first revealed at the 1880 Brussels exhibition and can also be seen in the paintings of Van Eyck, a Flemish painter. Originally these dogs were kept to keep vermin away, but today these dogs are companion dogs due to their charming character. This breed is well-known for it human-like expression and is also very cheerful. The Brussels Griffon is a very bright dog that is also very alert. This is a pleasant toy dog that makes an ideal companion dog. These dogs are spirited and curious, and they can also be very amusing and entertaining when they want to be. But they will also enjoy just lying on the laps of their owners. This is a very independent dog that also has a controlling streak if they are not rightly taught when young. At the same time, the Griffon is also very receptive, sharp and enjoyable to be around. The Brussels Griffon likes children - but is better if the children they are around are older. Children that are energetic and younger could put this dog in danger seeing that they are so small. This is not an outwardly aggressive dog, but they can be shy with new people and situations. The Brussels griffon prefers a calm setting and will try to avoid confrontation to the best of their ability. The Brussels Griffon is not a heavy shedding dog and shed very little hair. This is a low maintenance dog that does not require a lot of maintenance. A daily brushing is sufficient to keep their coats in a good condition and to prevent any mats from forming. It is important to also clean the beard around their mouths to avoid cakes from forming. It is important to be very consistent when training the Brussels Griffon. These dogs lose interest fairly quickly, and obedience classes are very important for these dogs at a young age. A good idea is to make the training sessions fun as this will help to keep the attention of these dogs. The Brussels Griffon does not suffer from canine conditions more or less than any other dog breed. Some of the conditions they have problems with include narrowed nostrils which can sometimes hinder their breathing, prolapse of the eyeball, eyeball lacerations, cataracts and progressive retinal atrophy. The Brussels Griffon breed is in the toy dog category, and is described as a Star Wars Ewok. The head is large with a round domed forehead. It has a very short muzzle that has the appearance of being pushed back, with a small short nose. This breed has an overbite with a hanging tongue. The eyes are prominent and widely set with long black eyelashes. The ears are high set and can be cropped or left naturally. The natural ear is carried in a semi erect position. This breed have straight leg bones of medium length. The tail is set high, and in some countries docked. This breed has two types of coat, rough and smooth. On the smooth coats, the fur is short, tight, glossy and straight. On the rough coat, the fur is dense and wiry. It is to be noted the short coats are easier to groom. Coat colours include red, brown with a little black on the chin and whiskers, brown coloured dogs usually have a black mask as well. Black and tan comes with a reddish-brown marking under the chin, above each eye, and on their legs. This colour is also seen around the ears and around the vent. History: The Brussels Griffon dog, as the name suggests, came from Brussels, and were first shown at the Brussels exhibition of 1880. In the 17th century, this dog was kept by cab drivers, to rid the stables of rats and mice. This breed then went on to become a companion dog. There is a large mix of other breeds, to name just a few, we see English toy spaniel, Yorkshire terrier and Irish terrier. Somewhat rare the Griffon may be very difficult to find. 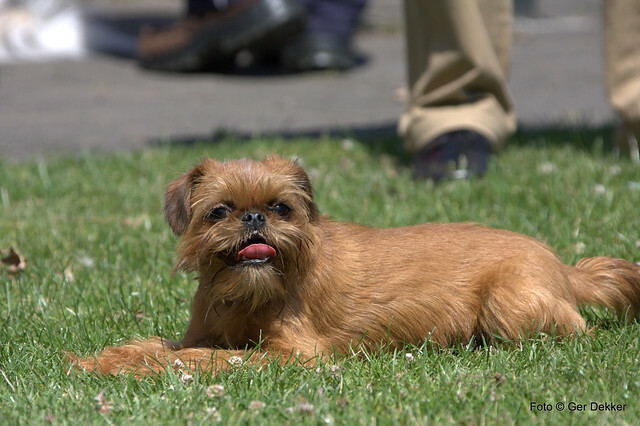 Temperament: The Brussels Griffon breed has a happy disposition, and is intelligent. This makes for a great personality and a fine companion dog. They are good with other dogs and cats. This breed is very affectionate lively and loves everybody. They make good watchdogs and can be taught to do tricks. Care is needed to help the dog know their place in the family, or they can suffer from small dog syndrome. It is not a good idea to treat this dog as you would a human baby, as this will cause the dog to wish to take over the home, and you will have a dog with behavioural problems. This can cause obsessive barking, over demanding, separation anxiety, snapping and even biting. If you remember this dog is a dog. With enough mental and physical exercise, they are a good companion and do not become highly strung, moody or oversensitive. This dog may be small, but still needs good leadership, with consistent rules that they must follow, to become a well-balanced dog. Health issues: The Brussels Griffon breed can have eye and respiratory problems, sensitivity to heat and prone to slipped stifle. Grooming: As mentioned earlier, the coat of the rough variety requires a lot of grooming. Grooming will need to be done at least every other day. The Brussels Griffon breed sheds little to no hair. Living conditions: The Brussels Griffon breed is good as an apartment dog. They can be very active indoors, but it is important that the dog is walked daily to fulfill their needs. For more information on different Dog Breeds, Dog Training and Teacup Puppies for sale including Yorkies, Chihuahuas and Morkies please visit our websites below.